All the Vitrified ware had it's own shape numbers, which makes sense to me as different clay and firing temps and even different glazes were used for Vitrified Ware. 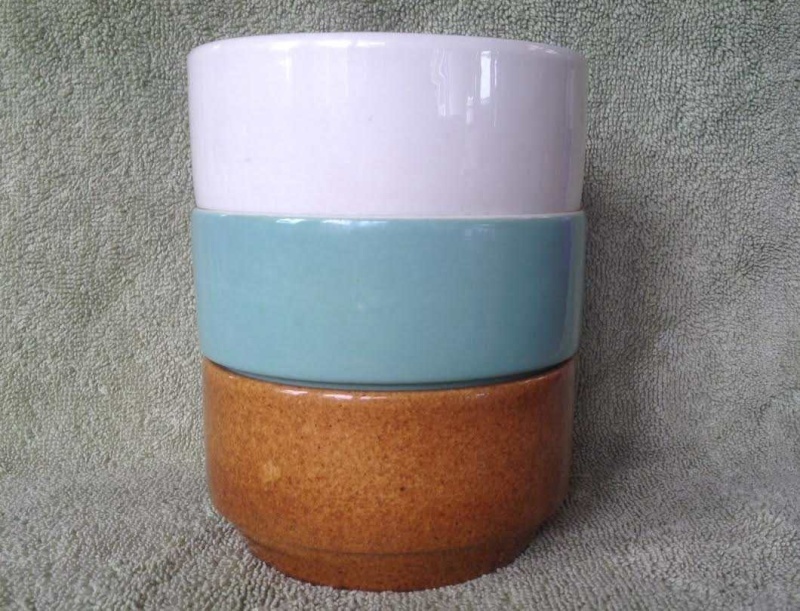 Looking at some shapes that I have collected I would suggest that this range is the Stacking Hotel ware .... and was made in a few different glazes. These were all first made in January 1973. I don't know whether the cup above is a tea cup or a coffee cup ..... help! ps but the jug has different handle? Fantastic Kat as I only have the larger teacup. 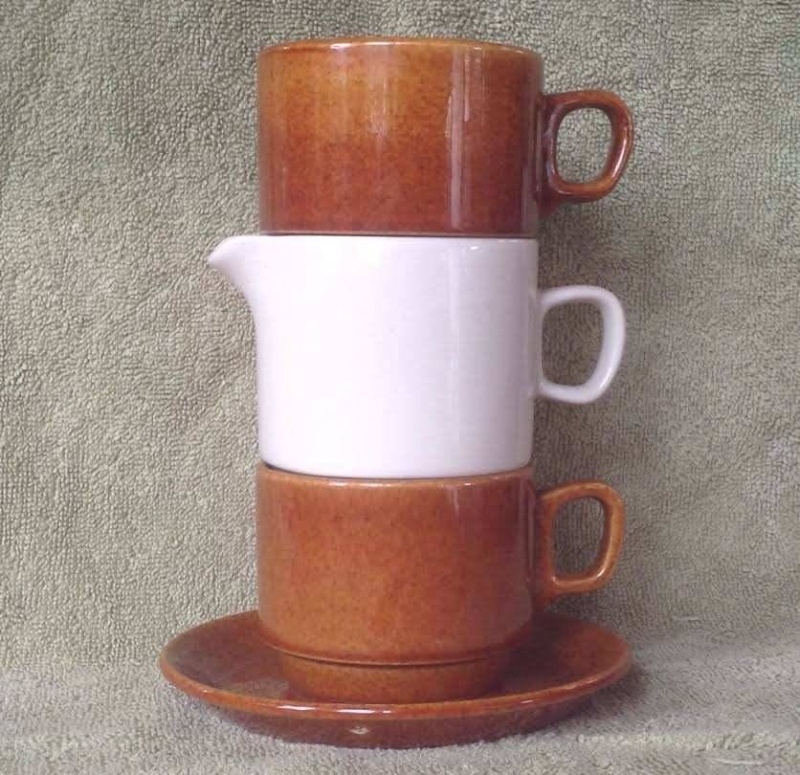 Yes the jug has a slightly different handle, but it is extremely similar and stacks nicely. Don't have any records for the 6611 vitrified jug, but at least it has a number on the base. with this broadband out I just lost my post trying to send it when dial-up had switched off so I'll try again. No pics til broadband happens again. One sugar bowl, 10 teacups (6.5) with SAUCERS, and SMALL BOWLS in Pioneer glaze from the same sauce, some years back. Saucers not noted above, nor bowls. Saucer 13.5 x 1.7. 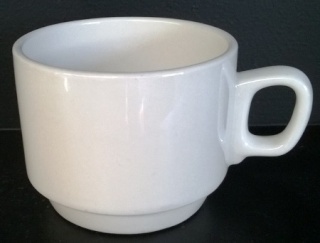 The double foot ring on the cup locks into ridge on saucer but it LOOKS LIKE a well for a cup with a small base. 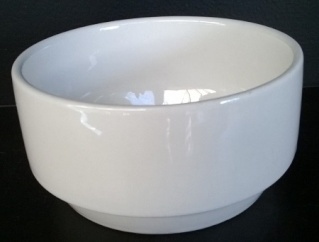 Bowl 14.5 x 3. Ridge on underside of rim. 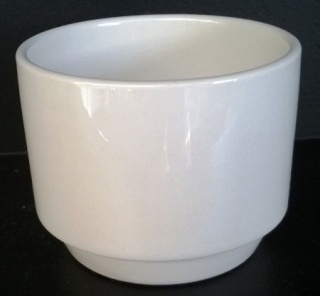 Bowls stack on rim not base. The 6610 jug is a good match for the cups. Same width and same stacking base, same handle shape too. It stacks perfectly with the cups. It stands 8.5cm H and looks like an extended version of the 6611, which doesn't stack with them. They both appear to be vitrified. I have them in white. 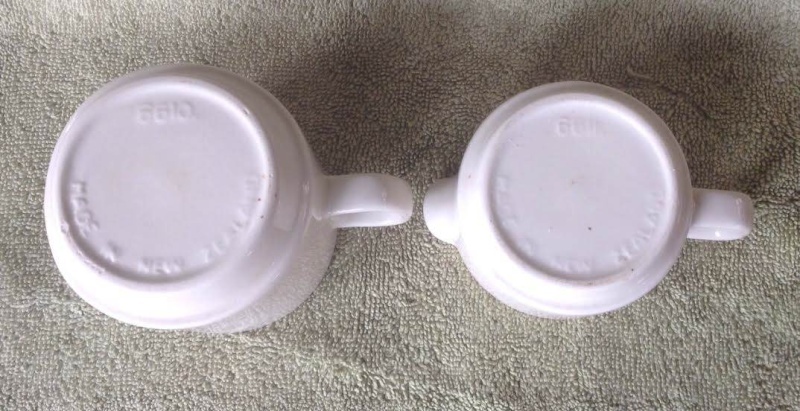 Found two more matching sugar bowls too, one white, one teal with white inside. White is vitrified, Teal may not be. 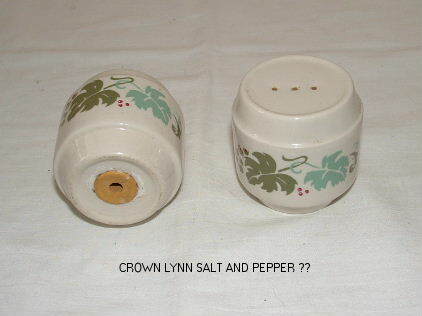 Is it possible that these salt and peppers from hon-john are the stacking ones? Now I know that this pattern is a vitrified one it has made me look at these with new eyes....... but my eyes fail to give me the answer I want! Ev, I added a little more above in an edit. The handle on my 6611 looks a lot more like the cups than Kat's, which may be in the photography. The difference is that the cup handle LOOKS like a glue-on and the jug handle cast as one with the jug. Thanks Jeremy, I don't think we have a number for that bigger 6611 do we? Will leave the sugar bowls, unless they are stacking for another topic or it will get too confusing. Ev, the sugar bowls all match the stacking ones in your pic. 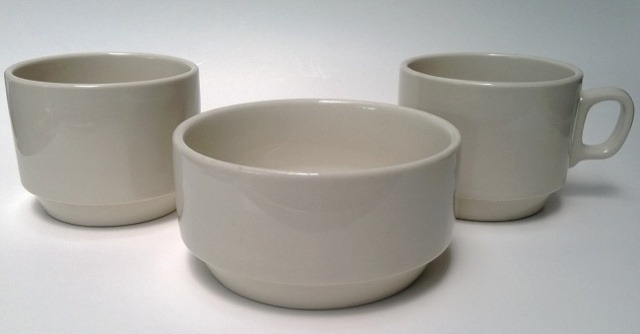 The other bowls are just curved in cross-section. There is no 6610 in the gallery and I will add it when I can. Yes, the number is on the base. As it stacks WITH the cups and as it has the same shape and size at the stacking end it looks a better match than the 6611 which has a shorter stacking bit. The 6611s will stack together but not with the teacups. Their spouts are the same shape. Thanks again Jeremy as I'm not sure why we don't have the 6610 jug already? It must be somewhere on here? what would this little pot be in front of the S&P pots? I have one of those and I call it a mustard pot. I think it should have a lid. But look at the salt and pepper!!! I really think they are the stacking ones! I remember stacking those salt and peppers in my parents restaurant when I was young. I had to wipe them all clean each day and stack them up on a tray. Their restaurant was full of Crown Lynn super vitrified but unfortunately they kept none of it. That shape with the maple pattern is exactly how I remember them except they were plain white or cream. I think the salt n pepper is correct..Are these the egg cup shape? Crikey you could be right on the dot there Kat !!!! I've never seen any with lids come to think of it .... beauty bonza! No I would have to buy them as we have Bantam eggs, currently most are clucky or have chicks...but I do think these are egg cups. I think that is a 6610 jug behind the cups that aren't stacking cups. Sorry Kat I've gone full circle and think the little pots are for mustard after seeing this boxed set that Thelma put on the site ..... Condiment Set - and it looks like it consists of salt, pepper, gravy and mustard ...? After thinking about this over night I think it could be both, mustard or egg cup..
the boxed picture shows no lid, usually mustards come with a lid don't they?